I'm thrilled to welcome guest poster Natalie So to Eat This Poem! Natalie So is a writer and photographer living in the Mission District in San Francisco. By day, she is the creative content manager at a tech company. Occasionally she writes on her blog my daily toast about eating out, food gatherings, and libraries. She is currently working on a series of interviews with artists and creators that makes visible the connection between belief, spirit, and the work we do. If you have a story to tell, please contact her at nataliejso [at] gmail [dot] com. Winter is coming quickly. The wind's edges are sharper, dusk falls earlier, and the golden light fades into a grey palette. The arrival of winter has never been easy for me. This became especially true when I moved to New England from California and learned the importance of wool socks and leather gloves for the first time. From November through April, until all the snow had finally thawed and we could go down to the Charles River and sunbathe in what felt like a tropical 60 degrees, winter swaddled my mind and my heart. Sometimes it felt more like smothering. It takes a hardy Californian to bear the tantrums of New England winter. One winter I made a nightly routine of drinking hot chocolate and eating a big bowl of popcorn while listening to Joni Mitchell's Blue on repeat. In our living room, my best friend and I would lay in our hammock (our "couch") together or paint and re-paint our coffee table, whose layers of pigment were like the growth rings of redwood trees, histories of sadness and joy. We do what we can to survive, to weather the seasons that pass. Sometimes it's a season of life that feels like a winter of the soul, a loss, a heartbreak, a defeat that feels like endless snow; our hearts freeze over and it feels like the thaw of spring will never come. Sometimes it's too difficult to even look forward to the next season, and all we can do is ground ourselves in the rituals that make each passing day a little better. That cup of coffee. That book. That song. That phone call. It's the hope of survival, knowing that bearing the winter is necessary for the blossoming and rejuvenation that spring promises. "The Pruning Book." He might be. the next year twice as high." "If you cut a butterfly bush / down to nothing it grows back / the next year twice as high," says James, in the poem "Kale" by Jordan Davis. The butterfly bush, known as a buddleia, is a deciduous shrub with purple and pink flowers (among many other colors) that blossoms in the summer and fall. However, during the winter, the shrubs die, sometimes all the way to the ground; even if they are not, it's important to prune all the flowers to stimulate growth. Winter is important time for the butterfly bush, as it is with the kale, but for a different reason. As opposed to the butterfly bush, which dies during winter so that blossoming is possible in the spring, kale grows well in winter and is actually made more flavorful after exposure to frost. Davis' poem is a vignette of winter life on a farm, the daily ritual of gathering from a garden to sustain oneself, an intimate moment of interaction between the narrator and (presumably) his son that becomes a kind of quotidian sacrament—in spite of winter. In this ordinary act, there is much to be said about self-reliance, but the narrator also celebrates a kind of sacred and wonderful connection to the earth and to his garden, to winter and to kale and to his son, all these things in his daily life that sustain him well. With the passing of seasons, with cyclical change, there is death that brings life, and there is also continued growth. One of my grounding rituals is eating at Linea Caffe, an espresso bar around the corner from my apartment. On an unassuming corner, Linea is a small space with only standing room and a few tables outside—minimal design with polygon wood panels and red accents. Not only do they serve espresso drinks served in beautiful red Heath Ceramics tumblers, but they also have an impeccable selection of waffles and salads. No pastries, just waffles and salads—creative, wonderful edibles. On weekend mornings, the peanut butter and jelly waffle is a true delight, but for weekday lunches, I return over and over again to the kale salad, a heaping pile of bitter greens massaged in an avocado dressing, with orange wedges, pecans, and fried shallots. Rita, one of the baristas there, assures me that this kale salad, which is also her favorite, won't ever let me down. It doesn't. So let this salad sustain you through the winter. Maybe this kale salad can be your daily ritual, one that grounds you as you weather this season and look forward in hope to the next. Linea Caffe uses a kind of baby kale that I cannot seem to find anywhere, but I love this the sprawling flat leaves and purple veins of Russian Red Kale, a variety available only around this time of year. The Napa cabbage, which is milder, adds a nice, brightening crunch to the salad. You won’t regret being generous with the dressing here, whose creaminess balances out the bitterness of the greens. The work in creating this salad lies mainly in ingredient prep; otherwise, it’s mere assemblage. To make it more filling, add in some shredded chicken thigh, which is an optional add-on at Linea. 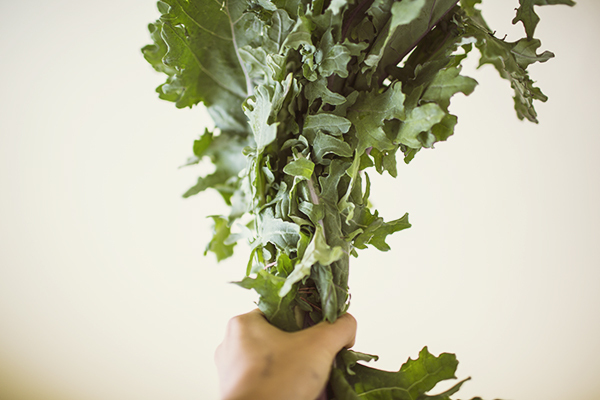 3 cups chopped Russian red kale (about 5 stalks), or whatever kale variety you have on hand. *Here’s how to cut citrus segments. **Here’s a tutorial on how to make fried shallots, but you can also buy them at Asian grocery stores, as they’re a popular ingredient in Vietnamese dishes. Preheat oven to 350 degrees Fahrenheit. While the oven is warming up, chop the kale and the cabbage. The preparation of this salad requires grooming the individual ingredients in order to make the Gestalt whole as it should be. I find that the best way to chop the kale is to first rip the leaves off the kale with your hands and chopping the leaves after. Let the rhythm of chopping be a meditation unto itself. The crunch of the cut into a large Napa cabbage is extremely satisfying. Ideally, you’d prepare this salad slowly and thoughtfully, letting yourself ease into daydreams and big ideas. Whenever the oven is ready, toast the pecans for five minutes, being careful not to let the pecans burn by checking up periodically. Do enjoy the aroma that the toasted pecans emanate, and you’ll see that the pecans are done by the darker color and shiny oils that have appeared on their surface. Remove from oven and set aside to cool. Prepare dressing by mashing the avocado with a fork. Stir in the olive oil and sea salt. In a bowl, combine the kale, cabbage, orange wedges, and dressing. Use your hands to massage the dressing into the kale, which is as it sounds: gripping and smothering the avocado into the kale, as with massage oil on skin. Finish by topping the salad with the toasted pecans and fried shallots. Consume immediately, but leisurely.